American centre Auston Matthews remains the consensus No. 1 prospect for the 2016 NHL draft, but Finnish goal-scoring winger Patrik Laine is doing his best to chip away at Matthews' No. 1 status. That is one of a number of intriguing developments in TSN's Top 15 rankings, the Draft Lottery Edition. At face value, nothing has changed from TSN's Mid-Season NHL draft rankings. Matthews is still No. 1; Laine is still No. 2. But when 10 NHL scouts were surveyed by TSN in late January/early February, all 10 had Matthews at No. 1. This time, in a survey of the same 10 scouts – conducted in the run-up to Saturday's NHL draft lottery – two of the 10 said Laine is now No. 1 on their team's lists. Others suggested they had to think long and hard about their decision to keep Matthews at No. 1. TSN Hockey Insider, Bob McKenzie joins Naylor and Landsberg in the morning to talk about the upcoming NHL draft and Steven Stamkos' road back from injury. Matthews hasn't played a game since his Swiss League season ended on March 10. Laine, meanwhile, was Tuesday named Finnish League playoff MVP, after leading his team, Tappara, to the championship – scoring 10 goals and 15 points in 18 games. The scouts surveyed said they will be watching with great interest the upcoming IIHF World Championship tourney, May 6 - 22 in Russia. Matthews has already been named to Team USA's roster. Laine is expected to be named to Finland's team. “Check back in a month, we're keeping an open mind,” added another scout, who said how the two perform at the World Championship could determine who will be No. 1 on TSN's final 2016 draft ranking, which will be released the week of the draft, June 24-25 in Buffalo. Even if Laine fails to overtake Matthews as the consensus No. 1, Laine's exceptional playoff performance has solidified his hold on No. 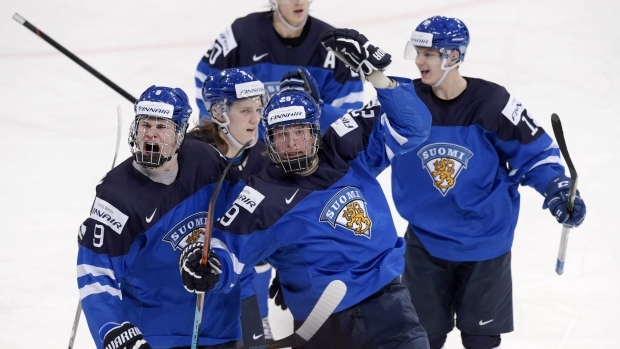 2, ahead of countryman Jesse Puljujarvi, the big winger who was exceptional in leading Finland to the U-18 World Championship in Grand Forks, N.D.
Puljujarvi remains entrenched at No. 3 – nine of 10 surveyed this week had him there; one scout ranked him second overall. What's clear now, as it was in early February, is that the Big Three is indeed the Big Three. No prospect outside of Matthews and the two Finns was ranked in the top three on any of the 10 scouts' lists. One scout said he allows for the possibility some NHL team may have someone other than Matthews, Laine and Puljujarvi in its top three, but is skeptical. "I'm not sure anyone picking in the top three needs to overthink this," the scout said. A defenceman being taken in the top six picks of this draft is by no means out of the question, but TSN's consensus on that is quite clear – forwards are currently Nos. 4, 5 and 6. London Knight winger Matthew Tkachuk is No. 4, followed by Cape Breton Screaming Eagle winger Pierre-Luc Dubois at No. 5 and Mississauga Steelhead winger Alex Nylander at No. 6. Tkachuk and Dubois are big body wingers who play power games and provide an extraordinary blend of grit and goals. Nylander is smart and skilled and plays a finesse-oriented game. Only two of the 10 scouts surveyed by TSN had a defenceman in their top five – one had Sarnia Sting blueliner Jakob Chychrun, a U.S.-born dual citizen who represents Canada internationally, at No. 4 and another had London Knight Olli Juolevi, a Finn, at No. 5. Only two other scouts had a defenceman in their top six. Three defencemen found spots in the Top 10 of TSN's Lottery Edition rankings but there's a wide divergence of opinion as to who's the best of those blueliners. Juolevi checked in at No. 7 overall, followed by Russian Mikhail Sergachev of the Windsor Spitfires at No. 8 and Sarnia's Chychrun at No. 9. They are the top three d-men in this draft. Juolevi is a heady two-way defenceman; a great all-around player who is solid on both sides of the puck but not necessarily considered elite in any one specific area. Sergachev is a big, strong, elite-level skater with great productivity and a cannon shot from the point. Chychrun is a physically mature two-way defenceman who can make an impact at both ends of the ice. Two more defencemen – Canadian Jake Bean of the Calgary Hitmen, an offensive blueliner, and American Charlie McAvoy of Boston University, a puck mover who can be effective on the power play – were ranked in the Top 15 of the Lottery Edition. Bean was No. 12 and McAvoy No. 14. Here's why it's not easy to get consensus on the relative ranking of the defencemen. Chychrun was the only defenceman to be ranked in anyone's top four prospects. One scout had him at No. 4 overall. But only four of the 10 scouts surveyed had him in their Top 10; six had him ranked 11th or lower. Worth noting, though, is that of the four scouts who ranked Chychrun in the Top 10, all four viewed him as the best defenceman in the draft. In contrast, Juolevi’s highest rank was No. 5 overall, but nine of 10 scouts had him in their top 10. Two scouts had him ranked as the top D-man in the draft. Sergachev’s highest rank was No. 6; seven of 10 scouts had him in their Top 10 but only two ranked him as the top defenceman in the draft. Bean got two votes in the top 10 and McAvoy only one; Bean was viewed as the top defenceman in the draft by one scout. Penticton Vees' defenceman Dante Fabbro, who played for Canada at the World U-18 Championship in Grand Forks, didn't quite make the cut for TSN's Top 15, but he did get one vote in the Top 10 (No. 5) and was deemed the top defenceman by that one scout. It’s another good example of the divergence of opinion on this year's blueline prospect pool. Two American forwards – centre Clayton Keller of the U.S. National Development Team Program at No. 10 and Windsor Spitfire centre Logan Brown at No. 13 – are big risers from the mid-season to draft lottery rankings. Keller moved up five spots and Brown jumped seven spots. Both played well for the bronze-medal U.S. team at the U-18 World Championship. Keller is a smallish but gifted offensive centre with elite creativity; Brown is a 6-foot-6 pro-style centre who put up good numbers in Windsor and improved as the season wore on. Keller had five votes in the Top 10; Brown had four. That brings to five the number of prospects in this Top 15 who wear the colours of Team USA internationally, equalling the five who wear the maple leaf of Team Canada (to go with three Finns, one Swede and one Russian). The Canadian equivalent of Keller and Brown – a prospect whose stock is trending up – is Penticton Vee centre Tyson Jost, who broke Connor McDavid’s Canadian scoring record at the World U-18 Championship. Jost was No. 13 at mid-season and has moved up two spots to No. 11. Keller, Jost and Brown have moved up, quite possibly, at the expense of Mississauga Steelhead centre Michael McLeod, who is ranked 15th on TSN's Draft Lottery Edition. The hard-driving Canadian pivot was No. 9 at mid-season. The 6-foot-2 centre projects to have NHL size and speed and he plays the game extremely hard, but scouts have expressed some concern about his offensive productivity at the next level. His fall from TSN's Top 10 was one of the more surprising developments; only one of 10 scouts had him as a Top 10 pick this time around. If this draft looks like it has a lot of uncertainty and fluidity, it's because there is. The World Championship will let us know if there's a legitimate battle for the No. 1 spot between Matthews and Laine or whether Matthews, in no small part because he projects to be a big, point-producing No. 1 NHL centre, is virtually locked into the top spot. If there's a given, perhaps it's that the Big Three of Matthews, Laine and Puljujarvi are highly likely to go one-two-three on draft day. TSN's consensus shows the next prospect "layer" to include the three wingers – Tkachuk, Dubois and Nylander – but there are two things worth mentioning here: 1. Personal preference will dictate what order they're taken; and 2. It is by no means out of the question that any one of a cache of five or six defencemen could supplant one (or more?) of the wingers in the four-to-six range. That's really where things will get interesting. As noted, there's a high degree of personal preference for the available blueliners – Juolevi, Sergachev, Chychrun, Bean, McAvoy and even Fabbro. And while one or more of the defenceman could jump up into that second layer of prospects behind the Big Three, the reality is the next layer of forwards – starting with Keller at 10, Jost at 11, Brown at 13 and McLeod at 15 – are all viable Top 10 candidates who could also push some of the defencemen further down the list. It should not be lost on anyone that the four forwards currently ranked between 10 and 15 are all centers, which of course is a premium position. The only other centre ranked higher than Keller, Jost, Brown and McLeod is Matthews, at No. 1. This is the type of draft, outside of the top four or five or six, where positional preference could come into play earlier than usual because there isn't a lot separating those prospects who would otherwise be considered “best available.” Also, every prospect currently ranked between No. 7 and No. 15 is either a defenceman or a centre. TSN Hockey Insider Bob McKenzie joins the Morning Show to discuss the NHL lottery and what fans can expect from Auston Matthews. That is to say there were three players who just missed out on cracking TSN's Top 15. Penticton's Fabbro led the way, but this group also included U.S. National Development Team winger Kieffer Bellows and Val-d'Or winger Julien Gauthier, who played for Team Canada at the World Junior Championship. There's obviously still time for prospects to see their stock go up or down before June's draft. The CHL playoffs, culminating with the Memorial Cup in May, afford those still playing an opportunity to make an impression. The World Championship, of course, could ultimately decide the first pick overall between Matthews and Laine. There's also the NHL scouting combine, May 29 - June 4 in Buffalo, when both physical testing and interviews can impact the final rankings. TSN's final 2016 NHL draft rankings will be released June 19, with the survey of our 10-member scouting panel taking place after the NHL Central Scouting Combine in early June. TSN rankings, as always, are not a subjective evaluation of who will be the best NHL players in the years to come as much as it is a consensus projection of when players will be taken on draft day.